"When taped to a gun barrel, the bullet will strike in the center of the black dot in the light. All I had to do was spray them as if it was a water hose; there was no need to use the gun sights." A curious statement by the author of the August 4th 1969 'Debut of Zodiac' letter, when in actual fact only Betty Lou Jensen was 'sprayed' with bullets. This leads to the bigger question- was the style of the attack at Lake Herman Road cemented in our minds as early as the utterances from Sergeant Leslie Lunblad in 1968, in that one person forced both David Faraday and Betty Lou Jensen from the passenger side of the vehicle and shot David Faraday almost immediately by the right rear wheel of the Rambler. The killer presumably had attached a pencil flashlight to his weapon to aid better sighting, as described in his letter: "What I did was tape a small pencel flash light to the barrel of my gun. If you notice, in the center of the beam of light if you aim it at a wall or ceiling you will see a black or darck spot in the center of the circle of light about 3 to 6 inches across." Then why would he approach David Faraday in near darkness to the point where he could apply a contact wound directly to his left ear, when he could simply have neutralized the male threat immediately, as he attempted to do at Blue Rock Springs and Lake Beryessa. In both these instances the Zodiac Killer kept a barrier between himself and the intended victims. However in this case we are told, that despite taking the trouble to facilitate a sighting implement on his weapon, he totally negated its use, walked up to David Faraday, to what must have been mere inches, to press the muzzle of the gun behind the left ear of David Faraday. Something doesn't ring true with this scenario. Assuming our killer was less experienced at this point in time, surely more caution would have been applied. This takes us to the second key point- why didn't the killer just shoot the two teenagers in the Rambler, where they are effectively corralled and contained within the vehicle, as he did at Blue Rock Springs six and a half months later. What was his objective in forcing them from the vehicle into an extremely dark turnout. At Blue Rock Springs, according to Michael Mageau's recollection, the killer remained silent throughout and began firing the instant he arrived by the passenger door. At Lake Herman Road the reverse was the case. The killer by all the evidence, ushered them both out of the passenger side door and then apparently approached David Faraday to literally within touching distance, in complete contrast to the caution he exhibited in his subsequent crimes. If however two assailants were involved in the murders, one could picture an element of bravado, where one assailant feeds off the other, and the concept of intimidating or scaring the victims was an overriding feature. 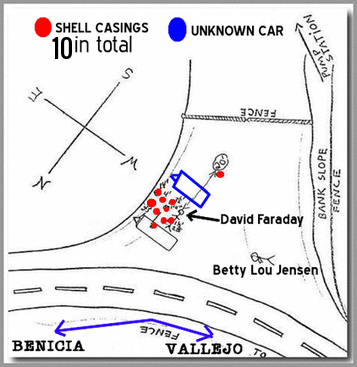 The Department of Justice report clearly stated that the bullet recovered from David Faraday did not exhibit the same right hand twist characteristics as the other seven bullets recovered that night. Although this is not conclusive proof of a second weapon or second shooter, it raises the question. With eight bullets supposedly recovered from the turnout and at autopsy, the notion of a second vehicle pulling up alongside the Faraday Rambler with two occupants stacks up, in terms of a ratio of 7:1 bullets fired from each particular weapon. Here is the scenario. The assailants vehicle pulls up approximately ten feet to the right of the Faraday Rambler. Both assailants exit their vehicle. Under this premise, it is obvious that the driver of the second vehicle is closest to the Rambler, so he immediately upon exiting fires a shot into the right headliner of the Rambler. This was found to have a straight trajectory and embedded in the upholstery on the upper left side of the Rambler. His ejected casing, as he is standing immediately outside his driver side door, flies to his rear, over the vehicle and likely lands to the right side of his vehicle, approximately 20 feet to the right of the Rambler, as shown in the police sketch. If the distance between the two vehicles is slightly greater, say 13 feet, then taking into account the width his vehicle of 5-6 feet, makes the 'stray' bullet casing look anything but stray. He approaches the Rambler and fires a second shot into the right rear window from approximately 4 feet, accounting for its trajectory of 17-19 degrees relative to the horizontal. His accomplice at this juncture has not yet fired a shot. He is still rounding the unknown vehicle and is furthest from the Rambler, so he is not the instigator to drive the couple from the Rambler. Besides, his partner is effectively in front of him, so firing towards the Rambler is not required, and would present a risk in near darkness of striking his accomplice. The driver of the unknown vehicle has now fired at least two shots, and gestures to the couple to exit the Rambler. Betty Lou, who is seated in the passenger side, exits the vehicle first and is secured by this assailant. The assailant from the passenger side of the offending vehicle has now arrived, and he now secures David Faraday, by the right rear wheel of the Rambler. There is now no risk associated with getting close to David Faraday. Betty Lou Jensen is being held with a gun likely pointed at her head. David has no choice but comply. His assailant is either standing directly in front of him, with the gun pressed to his left ear, making him a right-handed shooter, or he has him secured around the neck from behind, making him a left-handed shooter. David Faraday is essentially powerless to affect the situation. The other assailant then releases Betty Lou Jensen and tells her to run, firing 5 shots into her back from his illuminated weapon as she flees westwards, finally succumbing 28 feet to the rear of the Rambler station wagon. David Faraday, the only eyewitness left, is dispatched by the second assailant. His gun ejects the casing to the rear, into the open passenger side door of the Rambler, and is later noted lying on the passenger side floorboard. It however was later 'misplaced', and was never submitted to the Department of Justice for ballistics testing, leaving us all scratching our heads on whether this cartridge case may have exhibited different characteristics to the other nine casings recovered. 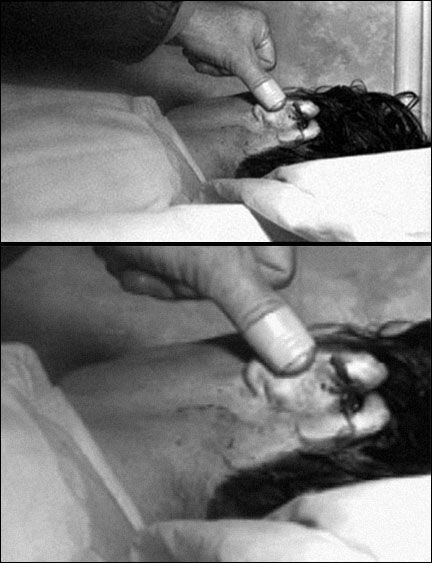 If so, then the importance of the bullet recovered from David Faraday at autopsy is greatly magnified, increasing exponentially the likelihood of two shooters at Lake Herman Road on December 20th 1968. It may have been the murderer of Betty Lou Jensen that wrote the 'Debut of Zodiac' letter and stated "All I had to do was spray them as if it was a water hose; there was no need to use the gun sights." But he may have 'spoke' out of turn, issuing this statement from his perspective, not the perspective of his accomplice. There is of course no way of establishing which of the couple was shot first, but the above example would play into the scenario of two assailants who wanted to taunt the young teenagers, in particular David Faraday. We also cannot dismiss the testimony of William Crow, who approximately 90 minutes before the double murder was apparently chased along Lake Herman Road by two occupants in a light colored Chevrolet or blue Valiant (depending on which version you believe). Two eyewitnesses incidentally, who never came forward. Is this because they returned to the turnout sometime after 11.00 pm. This would certainly explain their reluctance to present themselves to investigators. I'm trying to recall American serial killer 'teams' that have made the news over the years, Richard. What strikes me about those who I'm able to recall, people like Lake-Ng, The Hillside Stranglers, William Bonin-Vernon Butts and occasionally two others, is the typically sexually sadistic motive inherent to their crimes. Because the general outline of LHR, despite the differences you point out, rather closely mirrors the M.O. of other confirmed Zodiac murders such as BRS and Lake Berryessa--crimes in which we're quite sure, due to witness testimony, the culprit acted alone--I'm reluctant to say 12/20/68 was an exception to the rule. Just going on what I've read about acts of serial killing in which there is complicity, the murderers seem to conspire in a way so that they can achieve some sick and twisted prolonged 'satisfaction' through their acts. A hit-and-run style attack as took place here seems more likely the work of a lone individual--unless, perhaps, the theoretical pair had intended to kidnap the couple and their plan somehow went awry? Did they want to capture Betty Lou and she ran off instead? Even looking at the Manson family murders, we see a merciless clan who wanted to maximize the effect of their crimes by staining the walls with words in their victims' blood, etc. There indeed seems to be a ritualistic aspect to group killings whereby the murders don't happen immediately. The killers want to impose psychological control over their targets, in a controlled, typically indoor environment and this may take time--certainly longer than the quick hit attacks Zodiac was known for. Just trying to look at this through a different, more sociological lens. Zodiac to me is most similar to the Son of Sam murders that happened almost a decade later. In that case, of course, a lone killer was arrested and held accountable. Although, as we also know, there are those who still maintain, arguably the condemned killer himself in his own cryptic way, that there was an occult influence at play--specfically, Berkowitz may have had partners and did not actually pull the trigger at every shooting. The question is, were they unable to determine  because it was too disfigured or that it simply didn't exhibit 6 right hand groove class characteristics. Two bullets struck the Rambler, one striking the headliner and opposite side, but still had enough detail to examine. Through the sociological lens I tend to agree, and as you intimidated there is scant evidence to suggest two killers in the subsequent crimes, although I have tried my best to present such a case. If we are talking about MO's, I'm not convinced Presidio Heights or Lake Berryessa would have been attributed to the same killer as Vallejo or Benicia but for the communication and writing. Berryessa was a knife attack, wearing a costume, 50 miles adrift. The only connection was a couple. Presidio Heights for obvious reasons. There is a slim possibility two assailants were responsible for LHR, but only one continued, the other bound into silence by his participation in the first crime. But overall Greg, I am still of the opinion LHR was likely one killer. This is the only one of the four attacks that nags at me, in respect that no eyewitnesses remain. That's exactly it, Richard, LHR remains the anomaly in comparison to the other confirmed attacks due to the fact there were no survivors and a relative scarcity of witnesses. I see you've done many articles on the prospective timeline of events. Credit to you and others who've had the patience and tenacity to so painstakingly dissect the events of that night. This is certainly the one Zodiac episode, however, I've chosen, mostly, to not get involved with just due to the multitude of uncertainties and unknowns that comes with it. I think anytime there's a vacuum of truth like we have to the extent of LHR, our minds and imagination are going to work overtime tyring to fit together the pieces. I don't know if it's possible to ever arrive at a truly satisfactory outcome, and that's in equal measure part of the fascination and madness that results. I know you weren't actively promoting the accomplice theory in the article. It's always a good thought experiment, of course, when we can introduce alternative theories and see if they'll hold water. Like many others, I think the most probable way we'll ever get it solved is through the advancement of DNA analysis and other forensic technologies. The unfortunate thing, of course, is that no one appears to be doing any real lab work at this stage of the game, and perhaps none has been done since Allen's DNA was tested in 2002. There is now familial DNA testing which really should be used in the Zodiac case. There's a good chance that by running his DNA through the database there'd be hits of family members who shared a similar profile and it would become that much easier to trace back to the source. I guess we'll keep the fires lit and conversations flowing until that happens!